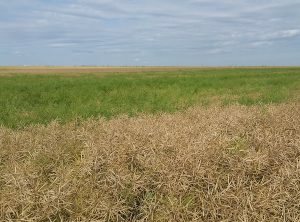 Variable maturity has been noted in several canola fields this year and as harvest approaches, pre-harvest aid options may be considered. It is important to clearly define what is needed, in order for the most suitable product to be used. Diquat (commonly sold as Reglone or Reglone Ion by Syngenta) is a chemical desiccant that will dry down green growth that it contacts but will not provide perennial weed control. Diquat destroys the membranes of any tissues present, so anything immature before application will dry up and blow out the combine or remain as green seed. It should not be used in fields with extreme variability. Also note that since diquat is a contact product that relies heavily on penetration and canopy coverage, using high water volumes (20 imp gallons) and smaller droplets will work best to maximize drydown the stalk material. Since drydown of the stalk is the main driver of application, skimping or cutting corners on application is not a wise decision. Glyphosate is not an effective drydown option and can result in undesirable residues in the grain if used as such. It is registered for pre-harvest perennial weed control in canola. Saflufenacil (sold as Heat LQ from BASF) is considered a pre-harvest aid, but it differs from a desiccant and the purely systemic activity of glyphosate, having a degree of both systemic and contact activity. With an earlier application timing and both contact and systemic activity, this product is better suited for a stand with variable maturities. See a full comparison of all three products HERE.